COLORADO SPRINGS, Colorado — Should recent geopolitical events ultimately prompt the U.S. government to build a domestic alternative to the Russian-built RD-180 engine that powers one of its workhorse rockets, it probably makes more sense to develop one from scratch rather than use the Russian design, according to U.S. Air Force Gen. William Shelton, commander of Air Force Space Command. But Shelton, who oversees Air Force space operations and procurement, also said it is too early to tell whether Russia will make good on threats to restrict the use of the RD-180 to nonmilitary missions. That threat was made by Russian Deputy Prime Minister Dmitry Rogozin in response to U.S. sanctions imposed following Russia’s incursion into Ukraine. The RD-180 engine, the main power-plant for United Launch Alliance's Atlas 5 rocket, is built by RSC Energomash of Russia and sold to the Denver-based rocket maker by RD Amross, a joint venture of Energomash and United Technologies Corp. (UTC). When that arrangement was set up during the 1990s, the parties agreed that Energomash would transfer the technology and know-how necessary for UTC to co-produce that engine in the United States. The idea of building a U.S. engine for the Atlas 5 has taken on greater urgency following Russia’s annexation of Crimea this year. 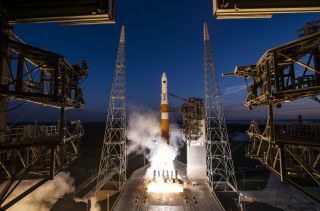 The House Armed Services Committee recently drafted a bill recommending that the U.S. Defense Department spend $220 million next year to develop an American alternative to the RD-180 engine. Shelton said it is his personal preference that the United States develop a domestic alternative, although he emphasized that such a decision is not his to make. He also expressed a preference for developing something essentially from scratch, rather than co-producing the RD-180. "I don't see us going into an RD-180 co-production mode,” Shelton said. "There will still be a reliance on Russian system engineering and subject matter expertise and all that. You haven't necessarily solved the problem." Shelton also said previous studies have shown that the difference in price between RD-180 co-production and starting from scratch are negligible. "There's not a financial savings and if one of the objectives is avoiding foreign reliance, you don’t get there in co-production," Shelton said. Shelton said he does not know where the money for a new engine development program would come from. But he was emphatic that it should not come from the Air Force's space budget, which he said has been stretched to the limit in recent years. Developing a new rocket main engine could cost more than $1 billion and take anywhere from five to eight years. U.S. lawmakers told Shelton earlier this year that it is their job to find the money. Shelton also addressed Space Exploration Technologies Corp.'s (SpaceX) ambitions to capture a share of the national security launch market, saying the company must fully certify its Falcon 9 rocket before it can compete to launch these payloads. The Air Force has certified one Falcon 9 flight to date but does not expect to certify the two additional required missions, plus review the company’s processes, before late this year or early next year, he said. Shelton said the Air Force has devoted more than $60 million and 100 employees to certifying the Falcon 9. "I think SpaceX would have a hard time going faster than we're going," he said. Nonetheless, SpaceX recently filed a lawsuit challenging the Air Force's sole-source award of a large number of launches to ULA. Asked to comment on the lawsuit, Shelton said, "Generally, the person you do business with you don’t sue." Meanwhile, in a keynote speech at the conference, Shelton outlined a future military space portfolio that could include a disaggregated architecture, but did not provide definitive answers about the direction the Air Force might take. Many in industry had anticipated — or hoped — the speech would hint at a clearer direction for the Air Force on several fronts, especially as the service has a series of internal studies and more formal analysis of alternatives underway. "I don't know where all of this is headed," he said.